DAy 9, Sunday 02/02/2014 – We were not sad to leave Patong as a mini bus pulled up by our hotel to take us to the Ferry Port where we boarded the Ferry Cruiser boat to Ko Phi Phi Island ( we purchased our Ferry ticket to Ko Phi Phi Don a day before in one of the many tour agencies in Patong, it also included the mini bus pick up from our hotel). We boarded the Ferry boat after queueing for a little while to collect a stamp like ticket that we then attach (glue) to our clothes. The boat was full to the brim and we struggled to find seats together inside, since it was so hot we did not want to sit outside although a lot of people did. As we sat down and made ourselves comfortable for the journey I decided to take an anti sickness pill just in case, although the sea was very calm and the journey was in fact very smooth. 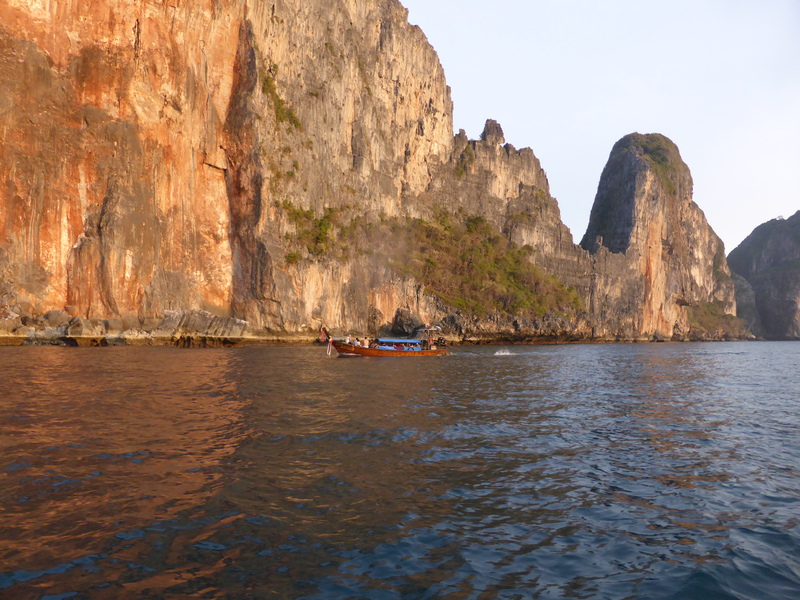 We came out into the front of the boat as we approached our Paradise Island, and were not disappointed with what we were seeing, with limestone cliffs towering above sea level as we passed long tail boats, sailing boats anchored on the bay, and the most powdery white sand I have ever seen. The cliffs are covered in green jungle and rise proudly from the sea, it looked surreal, like a scene from a special effects movie, a blessed beauty that can’t be described with words. 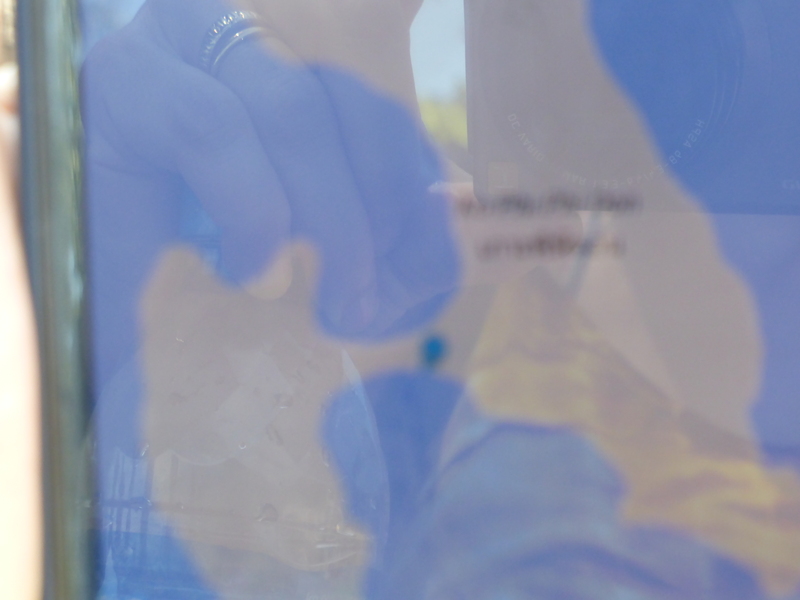 I felt the sea breeze on my face and as we approach the Island I could not hold back the excitement of finally arriving in a place I have for a long time dreamt of visiting. 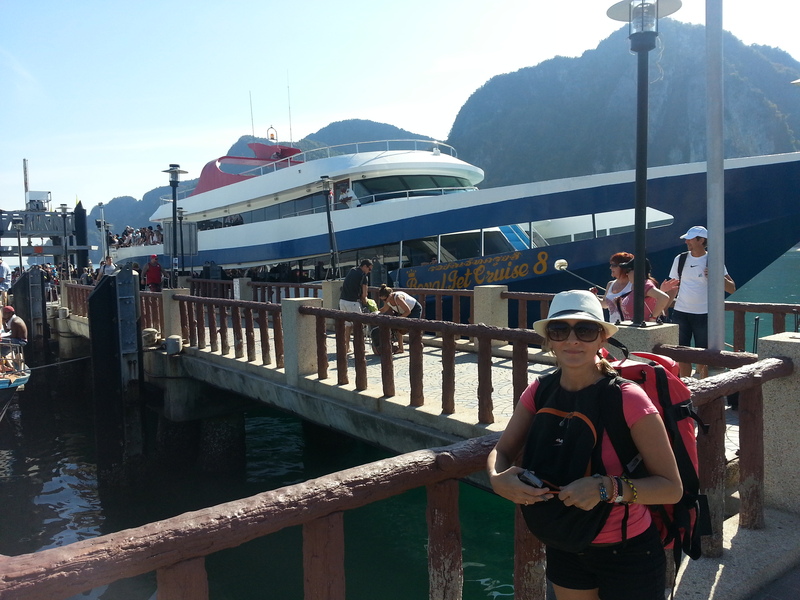 We arrived at the port of Ton Sai village and it was a bit of a scramble to get off the boat, with the mountain of luggage at the front of the boat making it difficult to spot our own backpack. It was chaos, everyone trying to find their luggage and get out of the boat, there was no system and it was a bit of a free for all … but tempers stayed un-frayed, no doubt helped by the beauty and tranquillity of the stunning surroundings..
We managed to get off and found our guide from the hotel waiting for us, he had the name of our hotel Dunsit Bangalows written on a card board. We were pleased to see him. Little did we know that without him our chalet would have been very difficult to find and we would have regretted every extra kg that we would have to carry in our backs. He got hold of our luggage (bless him) and strapped our backpacks to himself and started guiding us through the village. Up into the hills (up and up and up). It was a VERY steep hill to get up to our lovely little Chalet, we later christened the hill “Mount Everest” as it was incredibly steep and exhausting to climb. 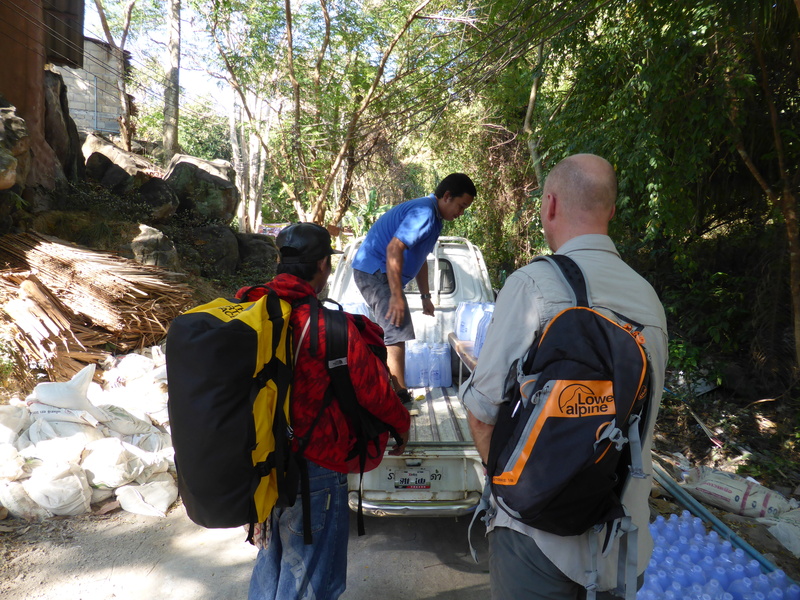 He was also struggling, poor guy and so he decided to get us all a lift into a little delivery van, that was going up the hill to deliver water bottles. We were glad to get on board. 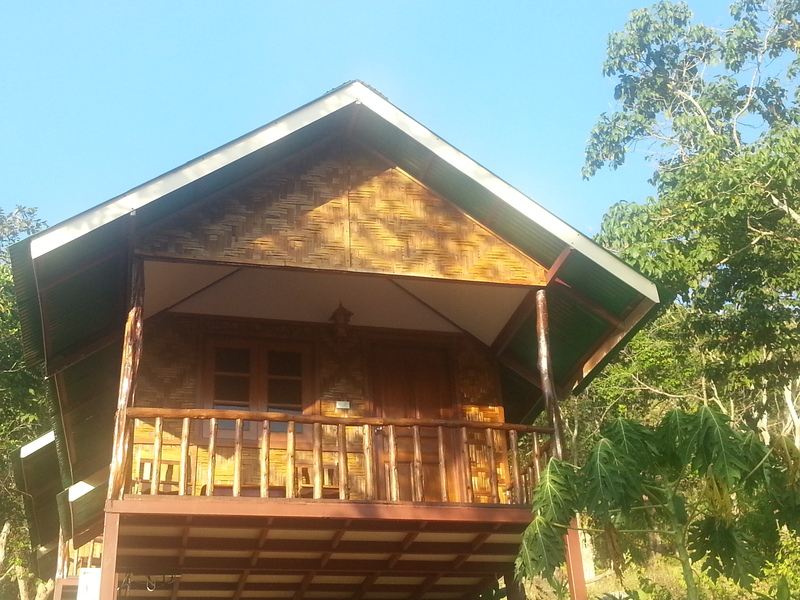 See below our little chalet ( we paid £ 50/ night, £250.00 for 5 nights, later we learned that we should have negotiated harder to get a better price). There are virtually no cars in the Island, only very few delivery vehicles. But people get around either by foot or bicycle and shops have small trolleys that they fill with groceries etc to take around for deliveries . After a good rest at our home for the next 4 days, we decided to find a place to have dinner. On the way down we stopped for a drink at the lovely Sunset Bar and enjoyed the views with a cocktail as we watched the sun go down slowly behind the cliffs and the lights of Ton Sai village twinkling in the distance. In our hearts we knew that we have fallen in love with this place. We eat dinner at lovely local place called Papaya. The food was authentic Thai, spicy and so delicious. 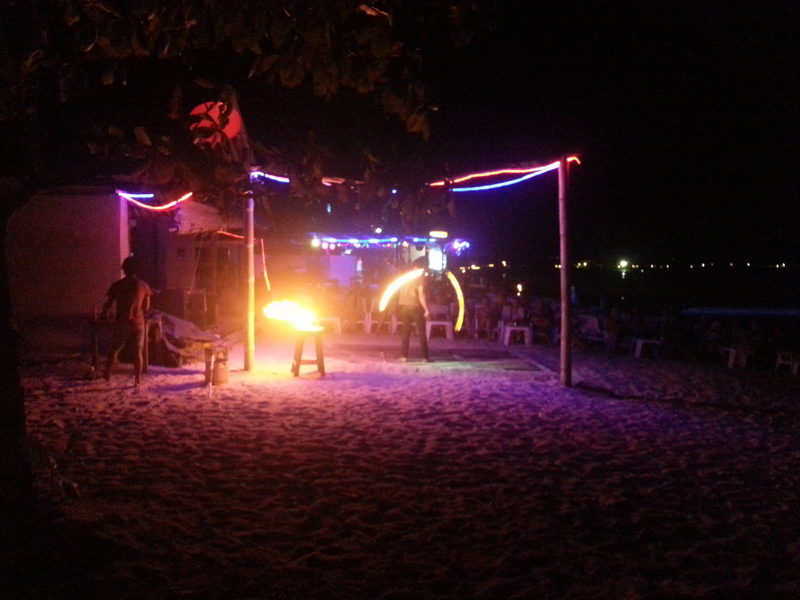 We were not surprised at how buzzing and lively Ton Sai was, since Ko Phi Phi is firmly on the tourists radar and well known for its party scene… fire shows and loud music that goes well into the nigh. It is true that no one can sleep on this Island. But guess what? WE LOVED IT! There is something special about this place, it has charm and it feels exciting. We loved wandering around and getting lost in its lanes, nooks and crannies. At night the place comes alive with music and the dim lights makes it so atmospheric and enchanting. We struggled up our very own Mount Everest at near mid night, with our bellies full of delicious food and dancing to the sound of the music that was carried over the waves of the sea and up the hill and into our little home. Out came our trusty earplugs and although the party went on until about 3 or 4 am, we slept well and woke up next day refreshed and ready for our boat excursion on a long tail boat. 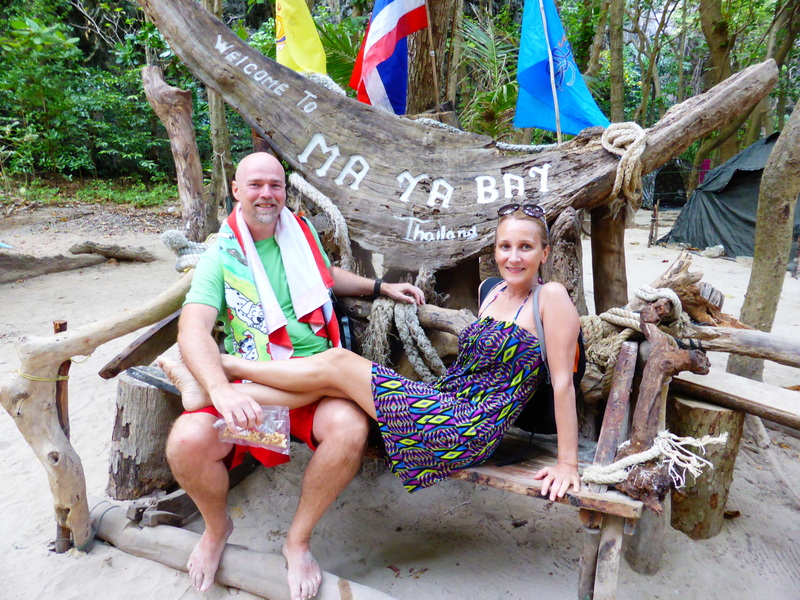 We bought the day excursion from the owners of our chalet; it entailed a day spent in a long tail boat, snorkelling in the coral reefs, swimming in the turquoise and warm waters and exploring the Islands amazing geography. 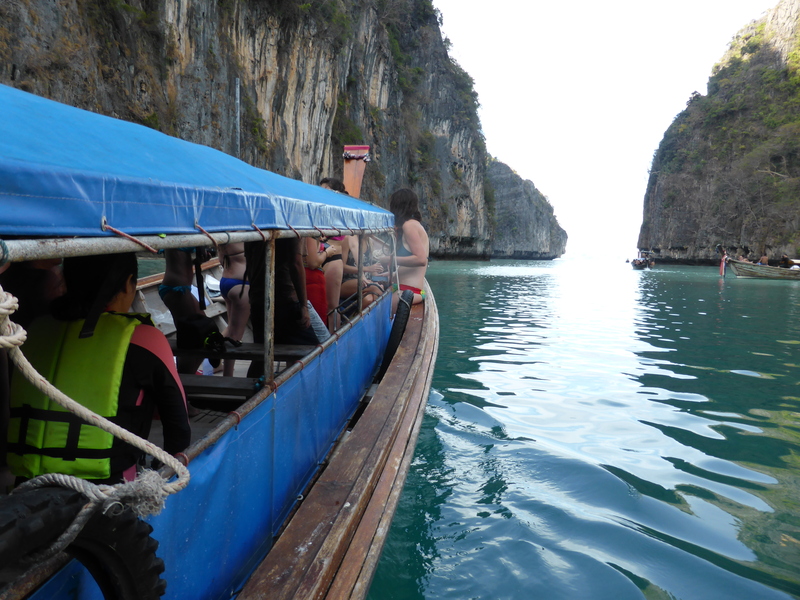 There are 6 Islands in the group known as Phi Phi and we were staying at Ko Phi Phi Don, the largest of them all. 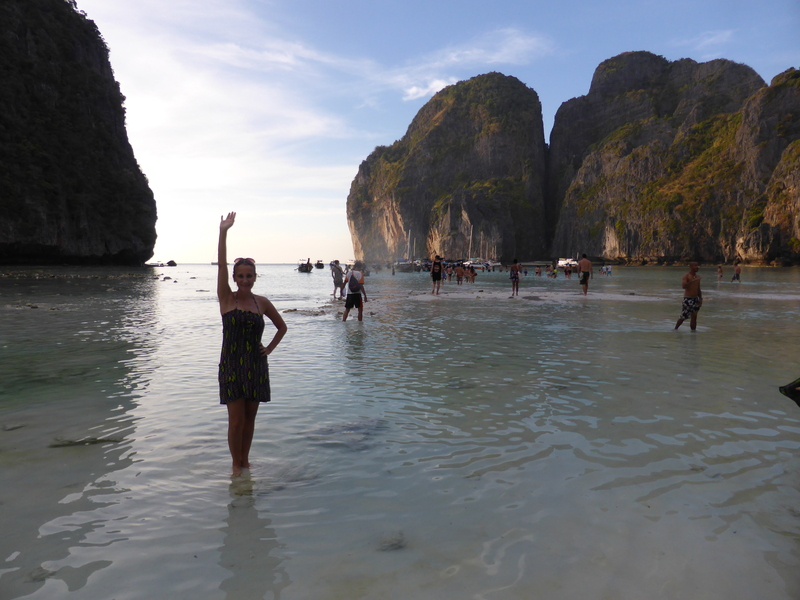 The second largest Island is Ko Phi Phi Leh – it is the most famous of them all as it was the set for the British American film ” The Beach” starring Leonardo Di Caprio and mostly filmed at Maya Bay catapulting it into the limelight. There were about 15 people in our long tail boat, just about the right number, so we all managed to have lots of space and be comfortable. 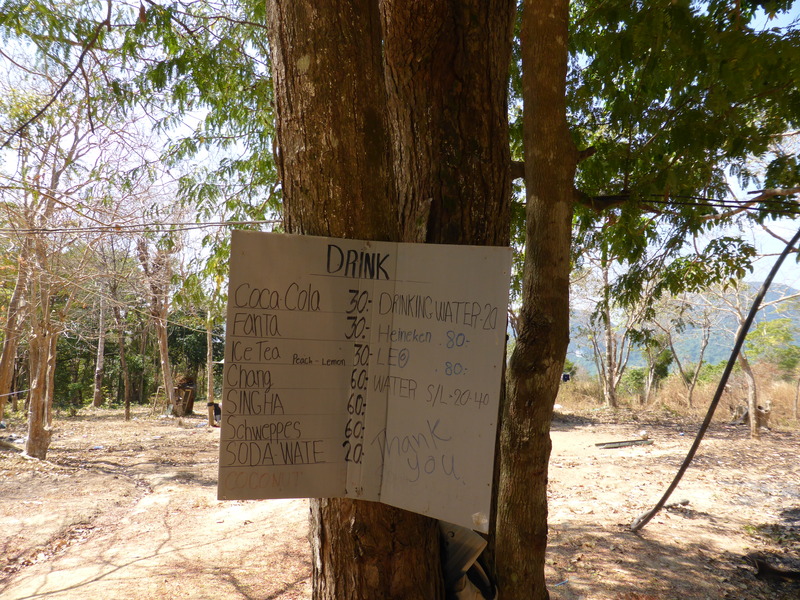 Food and drinks were included in the tour (we paid 600 baht for it + 100 baht to visit Bamboo Island). See below our boatman. 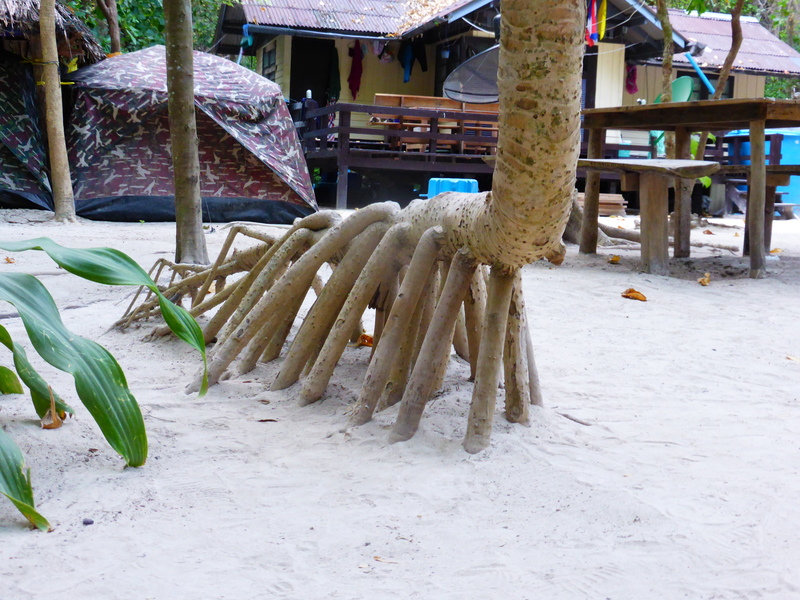 Bamboo Island was amazing. The most white, fine, powdery sand imaginable. As we stepped into the Island, I could not believed how soft it felt under my feet, it was like silk. We were given about 1 hour to spend there and explore, but we decided to just relax in the shade, taking in the beautiful scenery, although we did also got into the amazing warm sea for a swim, the water is transparent and teeming with marine life. Monkey Bay was one of the other stops during the day. 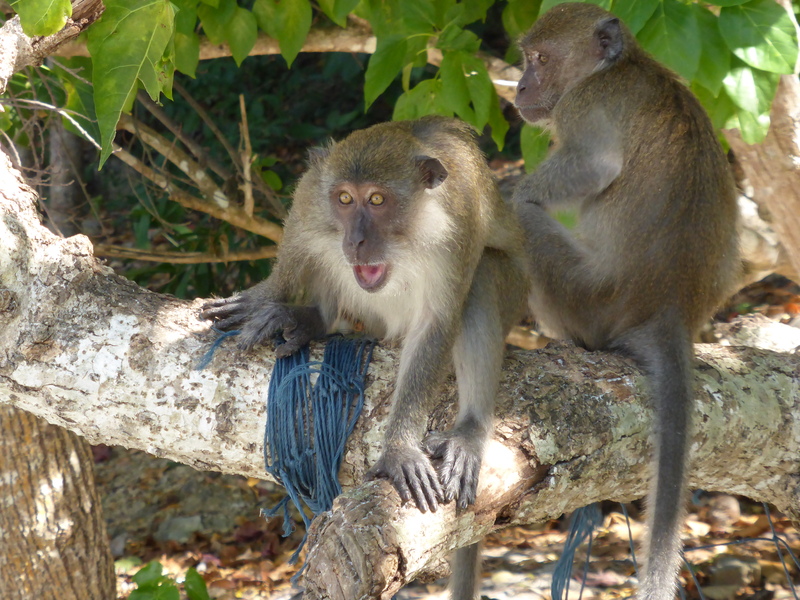 It was great, those cheeky little monkeys are such fun to watch as they steal food and drink from the unsuspecting tourists, fight with each other for scraps of food and bottles of water, and even became very angry and aggressive towards tourists that get too close or try to get stolen goods back from them. VERY entertaining. 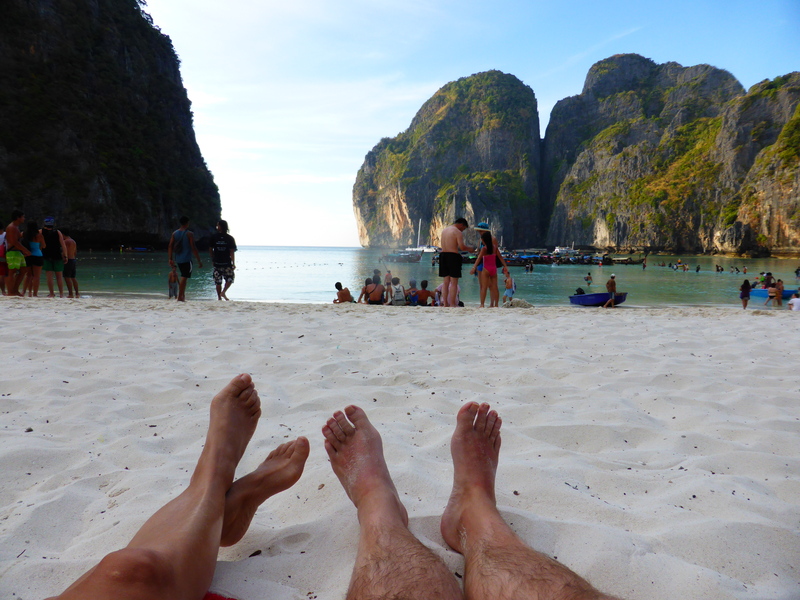 Maya Beach in Ko Phi Phi Leh…what can I say? With its stunning lagoon it is busy with day trippers, although I must say it was not crowded at all and there was plenty of space to lie down at the beach and take in the beauty of the gigantic rock cliffs .The tide was low and all the boats had to moor quite far out to sea. In particular the larger power boats. 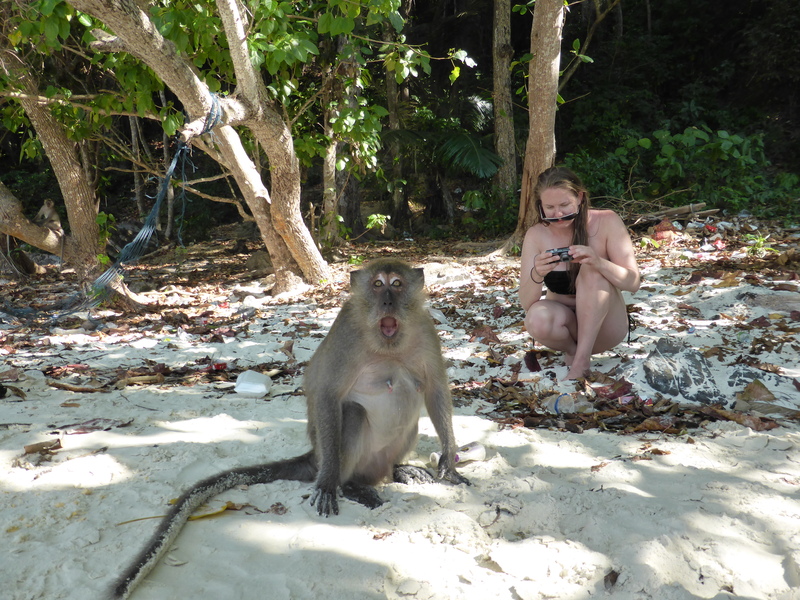 It was fun to people watch, groups of people posing for pictures, capturing a moment in a paradise island. I felt a sense of calm and happiness, as the evening was approaching and day light was slowly fading away, this day would soon be over and never lived again. We walked through into the interior of the Island to explore further where the film “The Beach ” was made and see where Leo’s character went off to smoke a “splif”. There is a lagoon in the interior of the Island, with the most incredible turquoise green water. 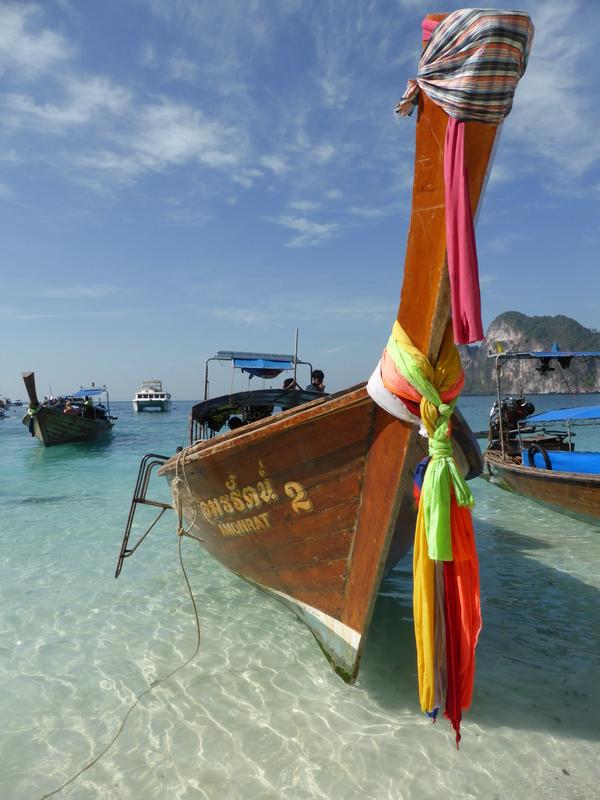 Phi Phi Leh is uninhabited, but it is possible to camp at Maya Bay and and to sleep under the stars in this idyllic place. I would have loved to have been able to do that, but we did not have enough time (maybe next time?). 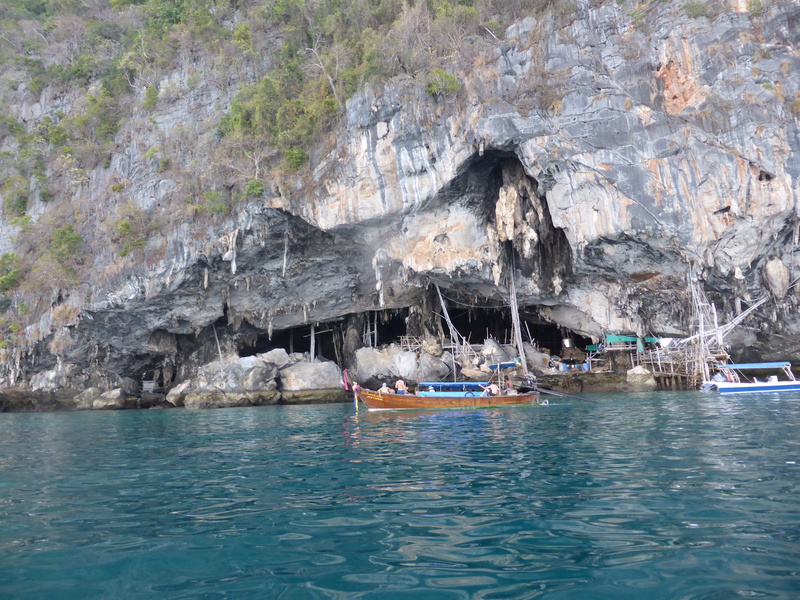 At the North-eastern side of the island , Viking Cave (Tham Phaya Naak) is a big collection point for swifts nests. A delicacy in Chinese cookery used for the famous birds nest soup. 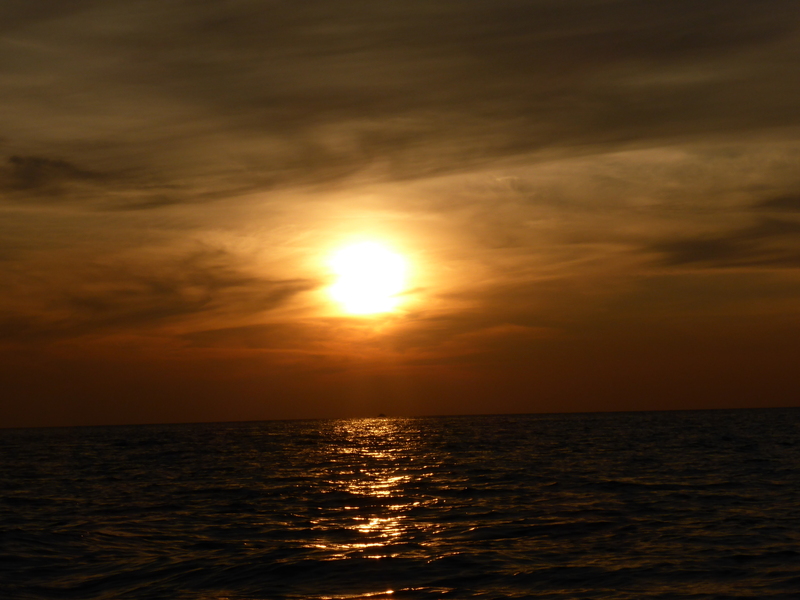 At the end of the day, we all watched the spectacular sunset from our long tail boat. There was silence as we all contemplated the sun disappearing behind the sea, perhaps we were all tired after such an exciting and active day or perhaps we were all thinking how perfect nature is, to give as this gift of warm colours and calm. In in our busy every day lives it is so rare to have a moment like this, when you just stop and look around you and contemplate what a beautiful world we live in. A great ending to our day exploring. 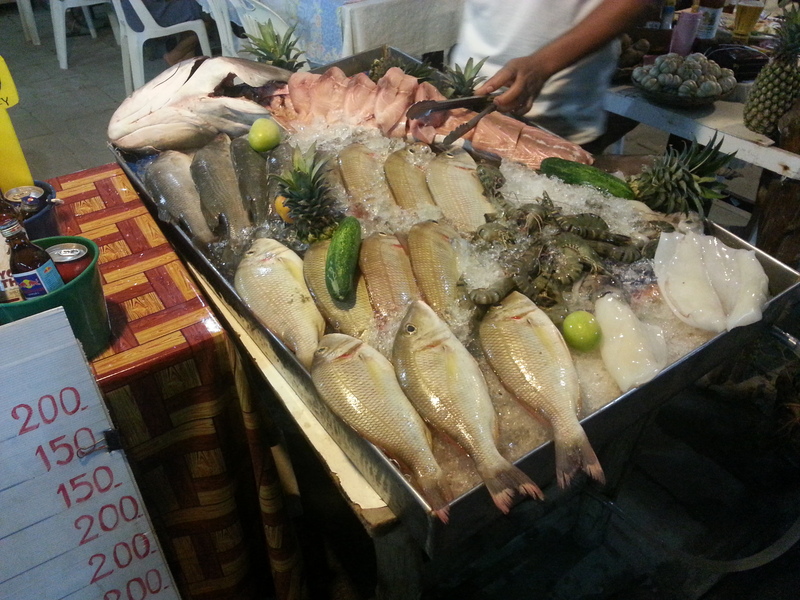 As dinner time approached and our stomachs started to rumble, we decided to try the local food market for a place to eat and I am so glad we did, since we found the most authentic and flavourful Thai food of our entire trip (so cheap). 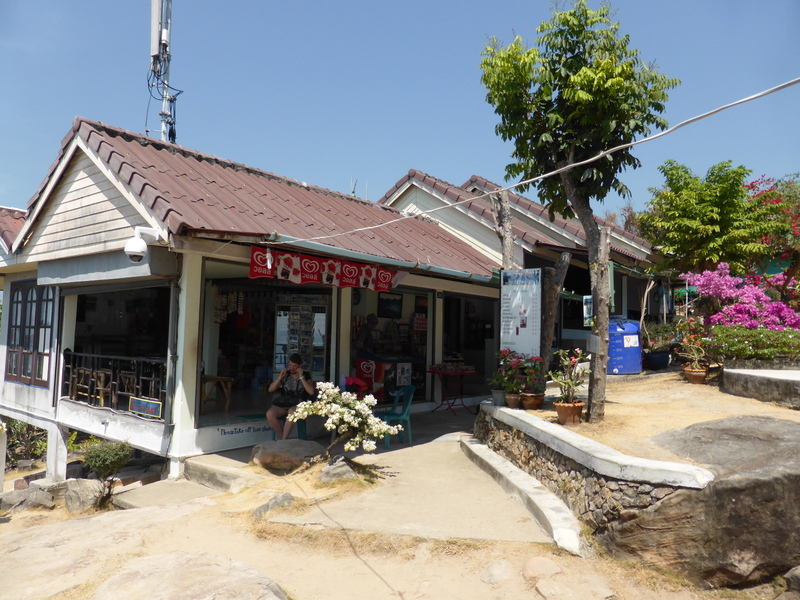 A very simple and humble family run little restaurant, with only about 4 tables and plastic chairs. The meal was truly scrumptious, cooked by a family that consisted of Mum and Dad, Son, Daughter and Grandmother. 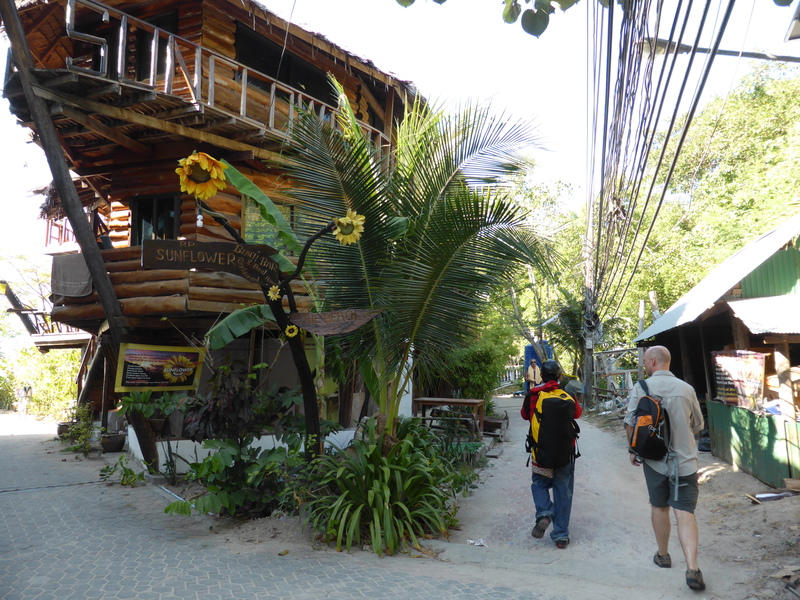 They were friendly, the service was great and the place was well frequented by Thai people, a good sign that the food was going to be special. 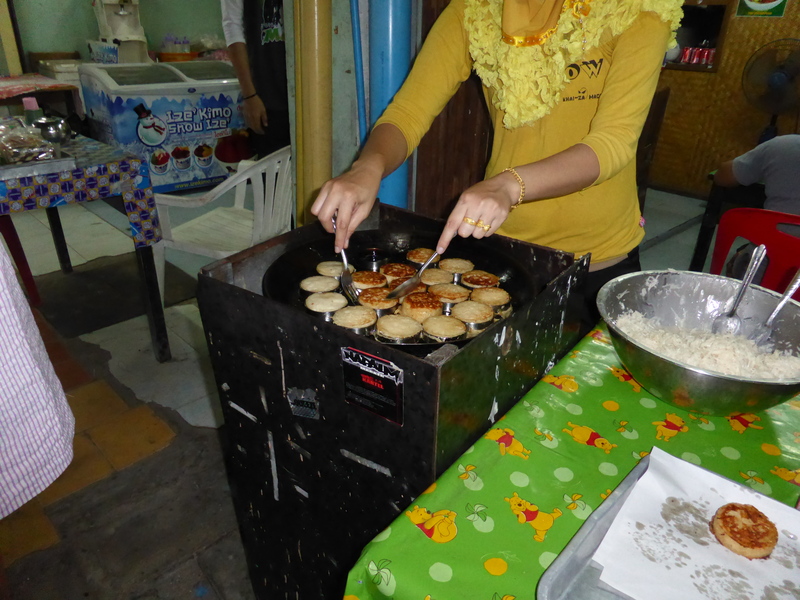 Every night we also stopped by a stall where a Muslin veiled lady cooked the most delicious little coconut pancakes, it was such a treat and gave us some extra energy to face the climb back to our top of the hill chalet. The end of our trip was fast approaching and on our last full day in the Island we decided to hike up to the view point. Half way up the very steep hill, we realised we had not brought any water and started to feel that we might have made a huge mistake. We were both very thirsty and therefore the word “water” was not pronounced by either of us, but there was a little glimpse of panic in both our faces. 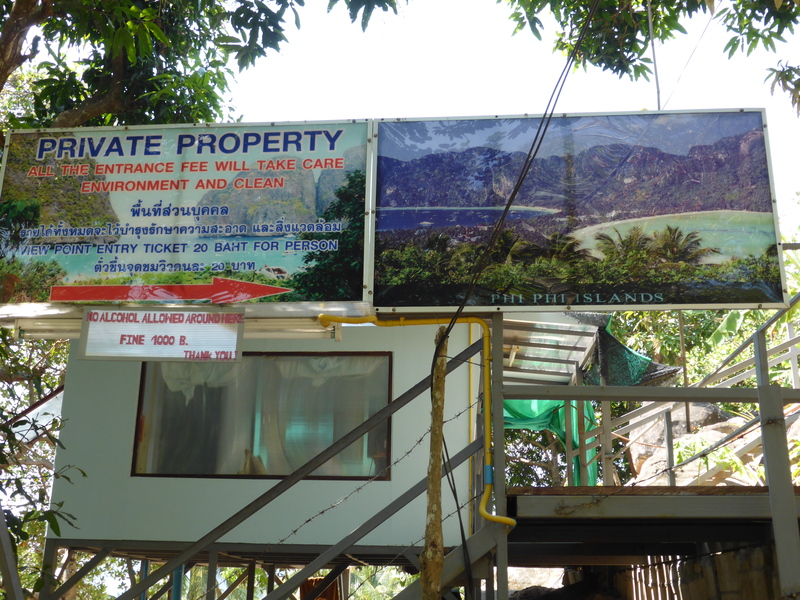 We were relieved when we saw a very humble shack, a Thai lady swinging lazily in a hammock, chicken, geese and cats roaming around and most importantly a sign that said “water for sale”. It was the best tasting water I have ever drank in my life. 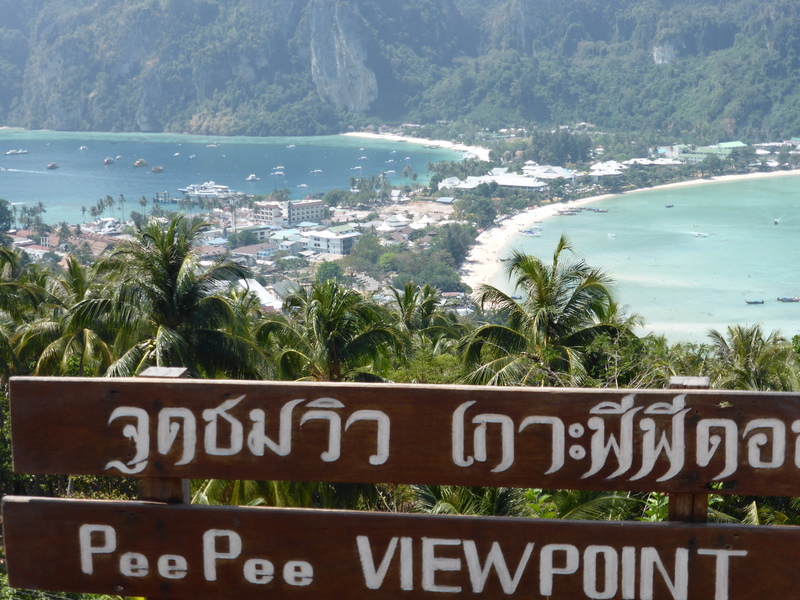 We arrived at the view point and paid our fee to get in (yes, you have to pay a little fee but worth every penny), we walked up the man made iron steps and stepped forward to see the most stunning view of Ko Phi Phi. There it was: our reward for the strenuous walk (only because we are very unfit, office people and we were puffing like steam trains by the time we got to the top). 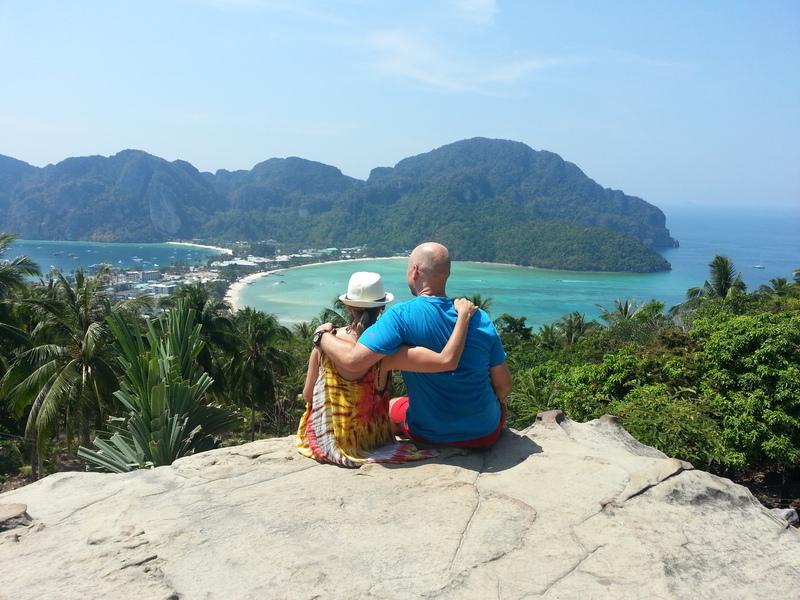 We spent quite a bit of time there and took lots of nice photos, showing post card views of the twin bays and also Ko Phi Phi leh in the far distance. We bought ice cream and fruit shakes from the little shop and enjoyed it all looking at this stunning views. 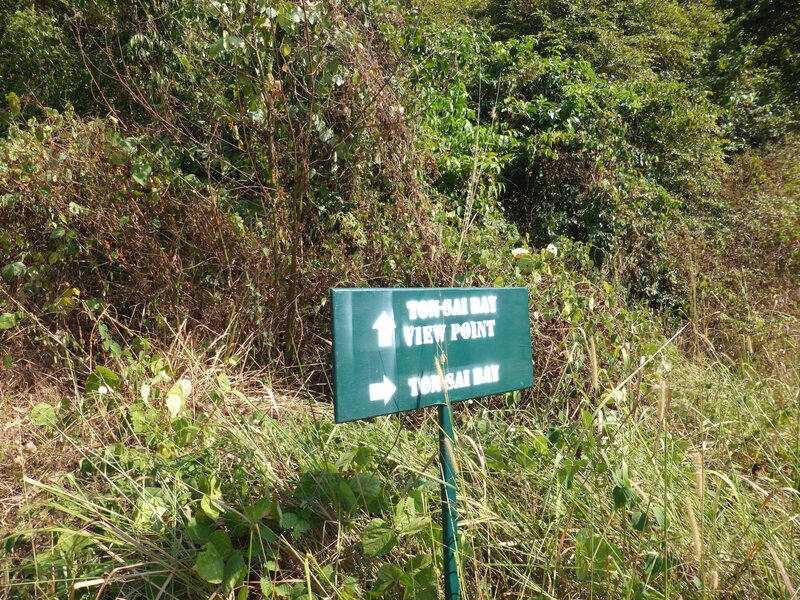 We probably spent about an hour there, before heading up to an even higher view point with views of the whole island, where we found ourselves looking down on a soaring eagle riding thermals up into the skies! Afterwards we decided (or were ill advised? 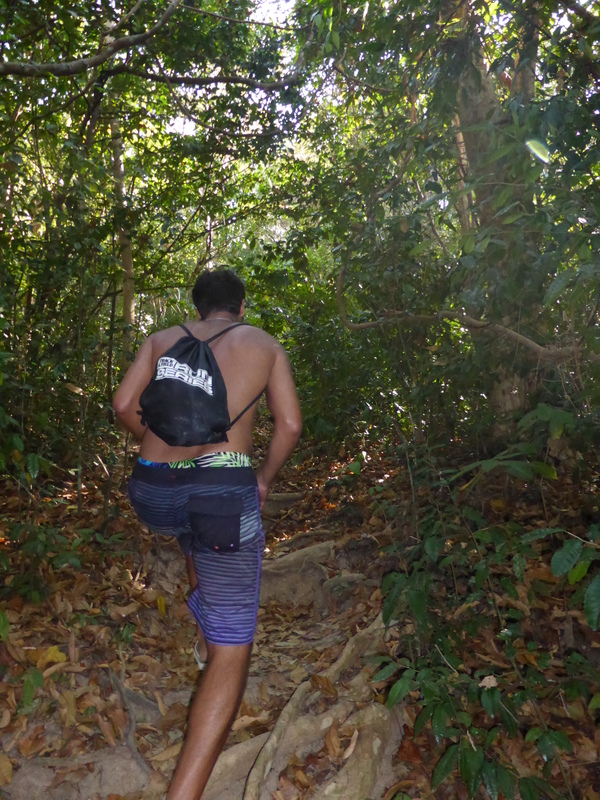 ), to make our way back to Ton Sai Village via a different path, through the jungle, via a very narrow and almost non existent path, meeting spiders, insects (but luckily no snakes) on the way down. We did get a bit lost and I did started getting a little worried, although Brian kept reassuring me that he knew the way (or rather his phone navigation system knew the way). As we finally found a sign, pointing to the village, we also found another lost guy, that turned out to be Brazilian, and who like us was starting to get just a little nervous about the lack of sign posting and lack of path and just trees and vegetation all around us. All that trekking left us feeling very thirsty again, so we and Roberto (Brazilian guy) decided to stop at a bar by the bay, just before the approach to Ton Sai Village… and here again we made some more friends as we got chatting to a group of sailors who have been sailing around the world for few years. A Spanish couple that have been sailing for 8 years and an Australian who has been sailing with his wife for the past 2 years. 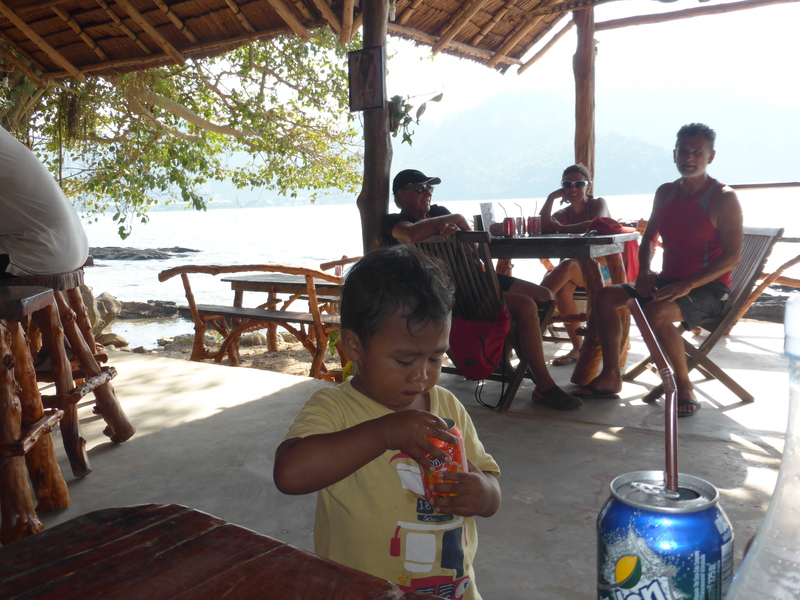 The little Thai boy was helping to serve the drinks and helping himself to some drinks, he kept as amused with his cheeky smile. 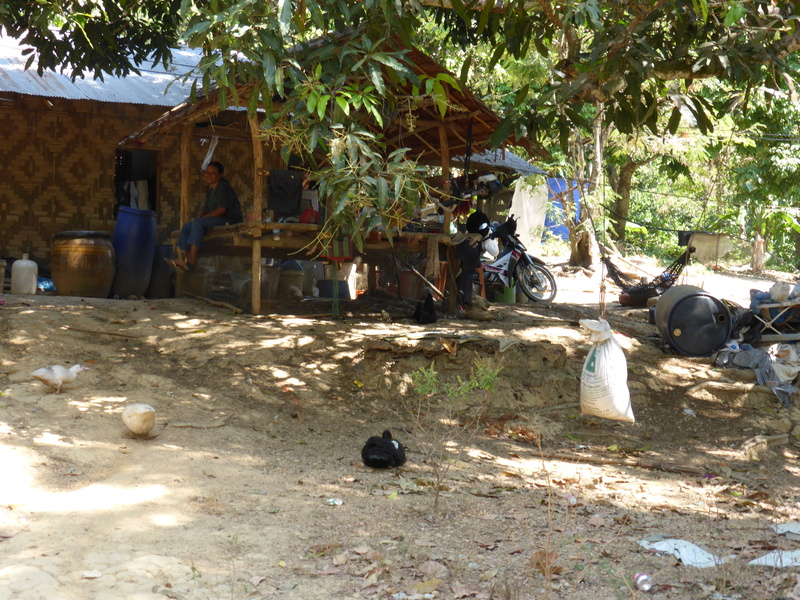 After hearing some of their tales and quenching our thirst we decided that it was time to head back to our Chalet, up Mount Everest, to have a rest and get cleaned up for our last night in the Island. That night we also decided to finally have a Thai massage (something we had been talking about and keen to do, but had so far not done it). OMG it was quite an experience!!! Poor Brian was massaged and handled by a very experienced lady who gave him a VERY thorough work out. As I lay next to him, also having my very own (lady boy) masseur, I could not stop laughing at Brian’s groaning and uhhhs and ahhhhs all throughout this again bizarre but very enjoyable experience. I think he was expecting to be gently stroked with some scented oils, but felt more like he was in a wrestling match as the tiny Thai lady literally crawled all over him pulling joints and muscles in directions they had never gone before! We flew back to Bangkok from Phuket the next day and stayed one last night at the lovely Riva Surya. 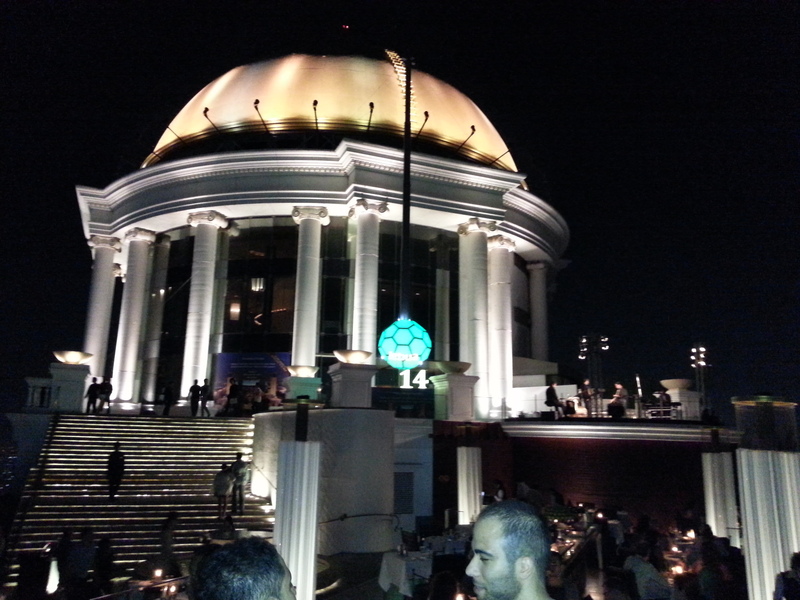 We enjoyed our last meal at their restaurant by the Chao Praya River with the bridge all lit in the distance. 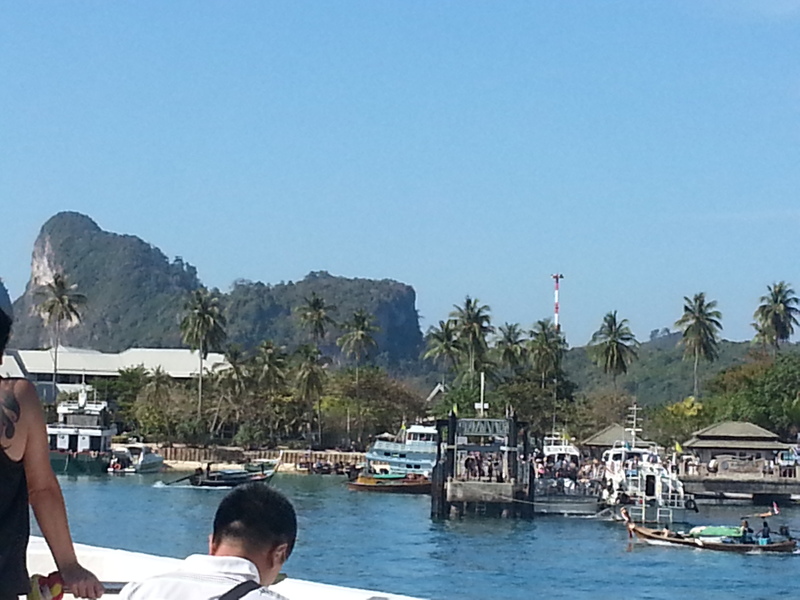 We watched the boats going up and down the river and talked about our adventures and sadness to leave Thailand. 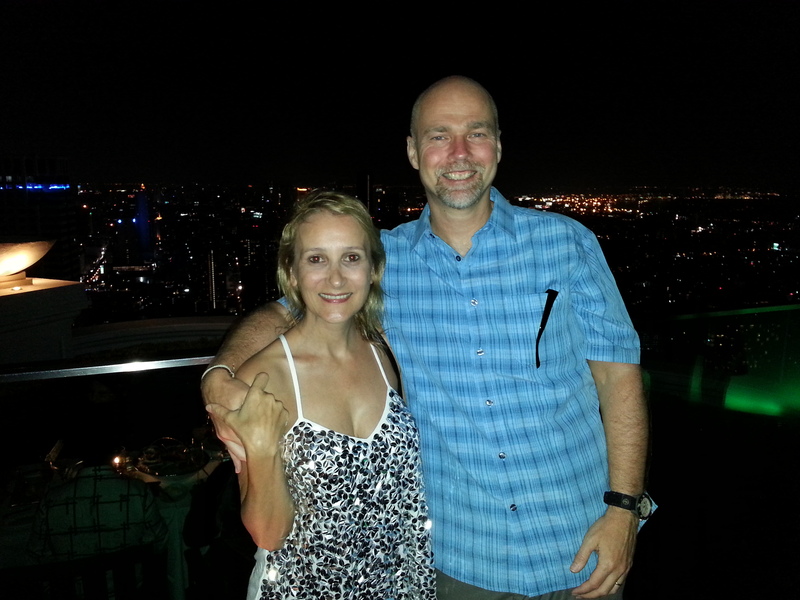 So as a last treat, after dinner, we decided to have a drink, at one of the many, lovely sky bars of Bangkok. 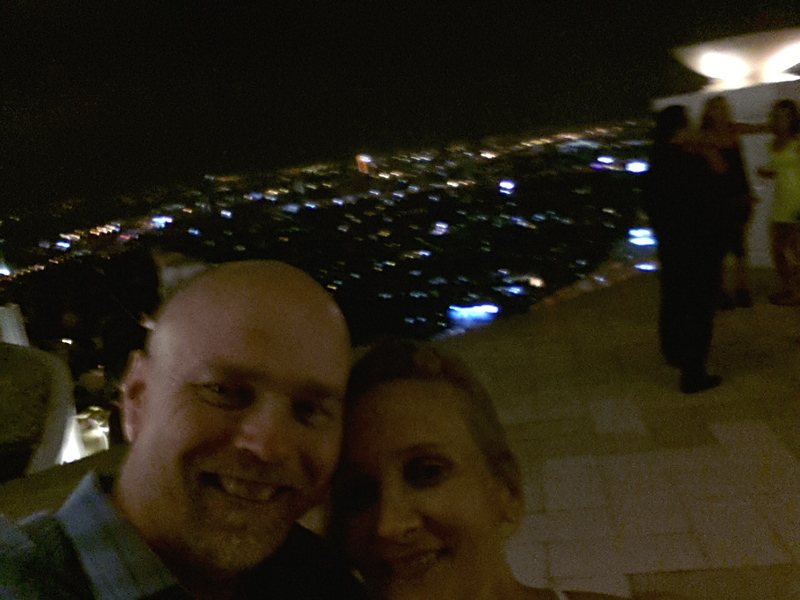 We got a taxi to Le Bua, a very posh hotel, where the Sirocco Bar is located on its 64 Th floor. 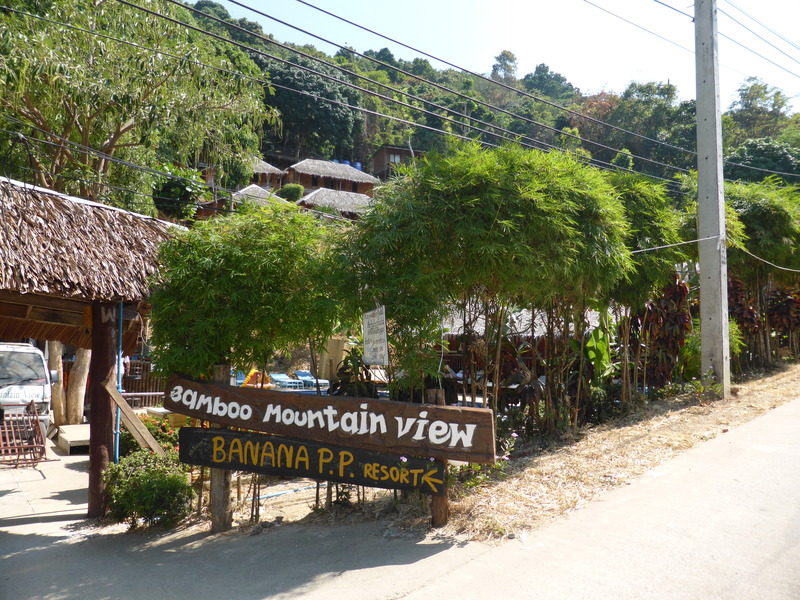 It is also where the film “Hangover 2” was filmed. What a fantastic view, and a fitting finale for our “flashpacking” adventure. 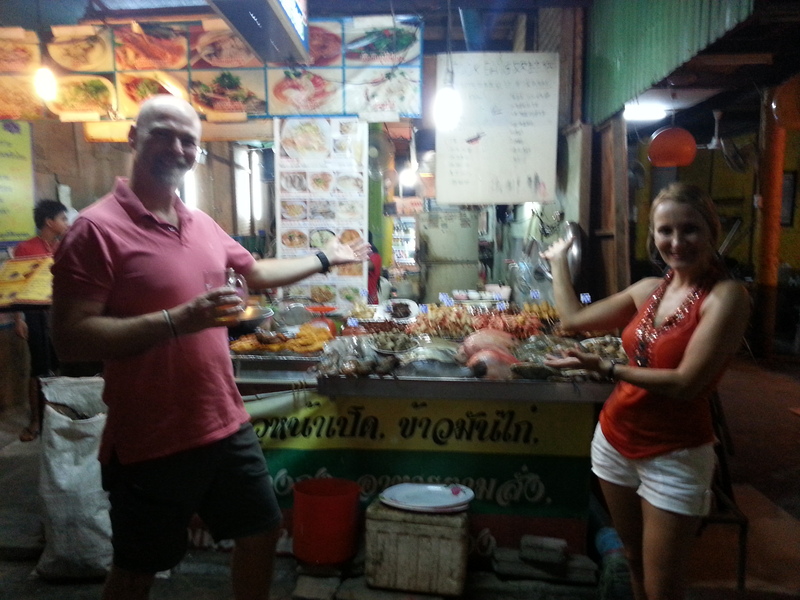 On our 2 weeks backpacking adventure we learned to cook Thai food and had some of the most delicious food of our lives.We explored Temples and a fascinating culture (I was blessed by a Master Buddhist) , we enjoyed a night train journey through this stunning country, we fell in love with elephants (and I was kissed by one) , and we met some incredibly friendly and smiley Thai people and other adventurous and interesting travellers. 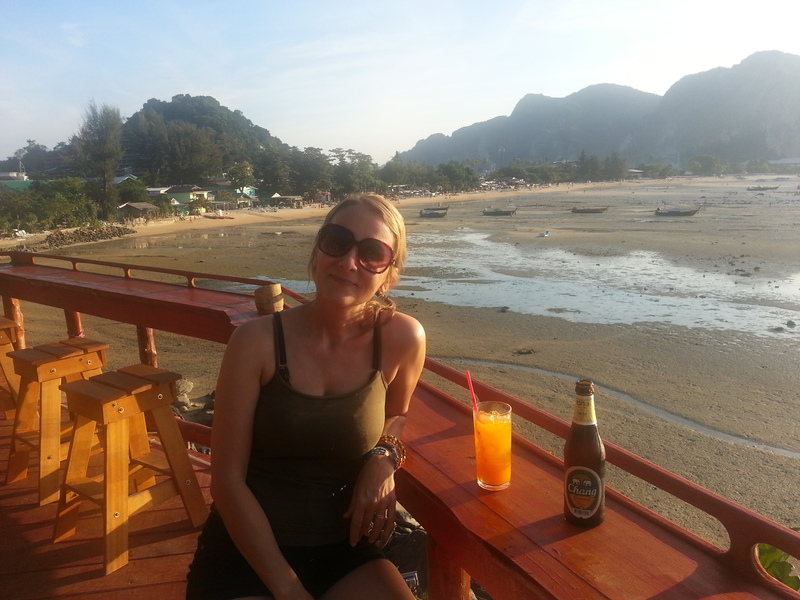 We packed a lot into just 2 weeks, but it left us feeling hungry for more, and envious of the many other travellers that we have encountered here and who were staying in Asia for a lot longer (lucky people). But perhaps that is a nice feeling? That there is so much more to explore here, and we certainly hope to be back here one day again. 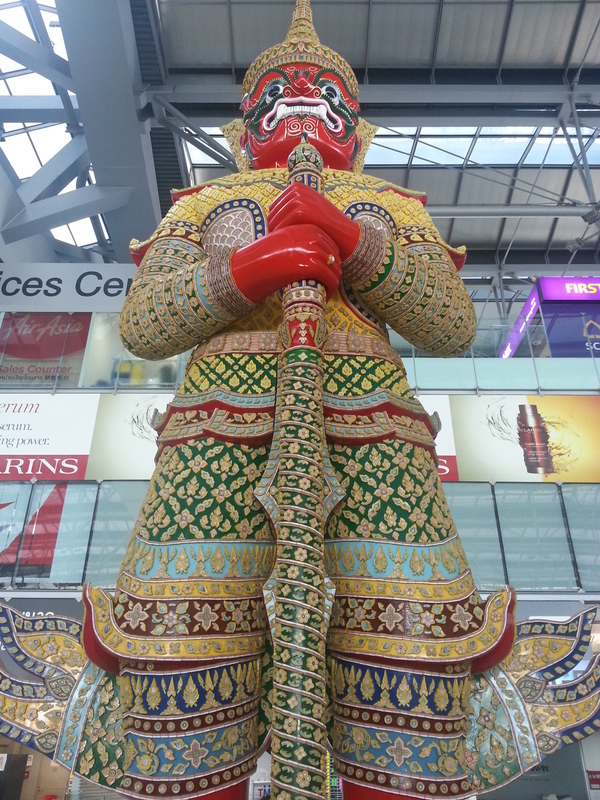 Good Bye Thailand! Thanks for the time of our lives. Oh my I have a serious case of wanderlust after reading this. 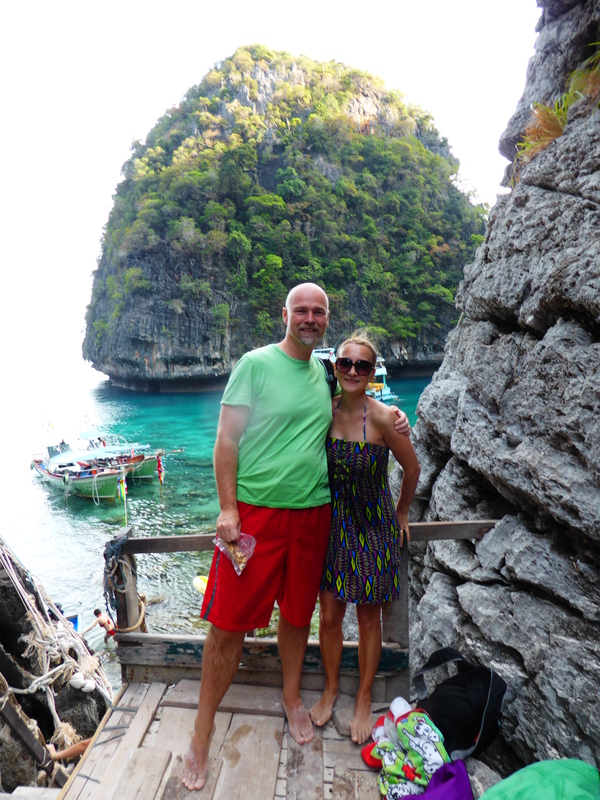 Those long tail boas, the amazing cliffs, the monkeys, the white sand….yes this one has long been on the travel list. I shall be dreaming of your lovely adventure.